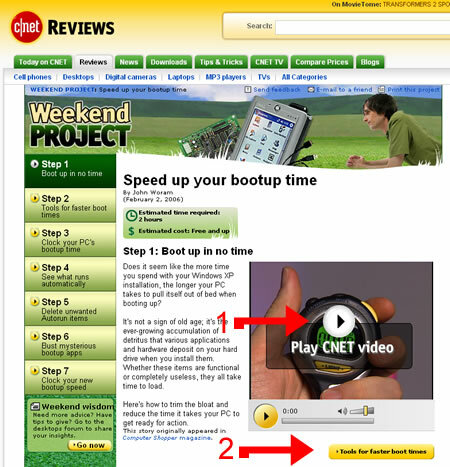 Need to speed up your bootup time on your PC with Windows XP installed without calling in your computer fixer? I found the perfect set of walk-through videos that speeded up my bootup process on my laptop from 22 minutes to 2 minutes! First, you’re probably wondering 22 MINUTES! Marty! Well, I let one of my helpers borrow one of my laptops for a few months and when it came back, I fired it up and, yep, 22 minutes to boot. Now, I might have a thing or two up my sleeve when it comes to Internet stuff, but that does NOT mean I’m a computer geek. In fact anyone who knows me (especially my highly competent techie helpers, knows how technically-SAD (as opposed to savvy) I really am. But, don’t tell anyone, okay?? Anyway, I couldn’t wait to get my computer guy scheduled to come look at my laptop, and I’m pretty good on the research front, so, I went to Google and started searching. I came across a series of videos that I’d like to share with you for a couple of reasons. First, go ahead and try the recommendations to speed up your own boot time if you’re on Windows XP. Actually, two of my computers with Vista I also used this process for and it worked just great. visit the site to see how they’ve laid out the videos along with the little commercial they have going on the front end and back-end of the short videos. Then, click on the button to take you to the next step. Notice how short these videos are. They take you through an ever-so-short series of steps and then you have to take the next move to go to the next page in the sequence and click the video button. It’s really an ingenious layout and a play on peoples’ need for speed. We just want the info and we want it quick. Good job guys and a great example to the rest of us for using instructional video to provide AMAZING and useful content for free to gain trust and brand loyalty. Definitely will go back to this site when I need something they offer. See how that works?